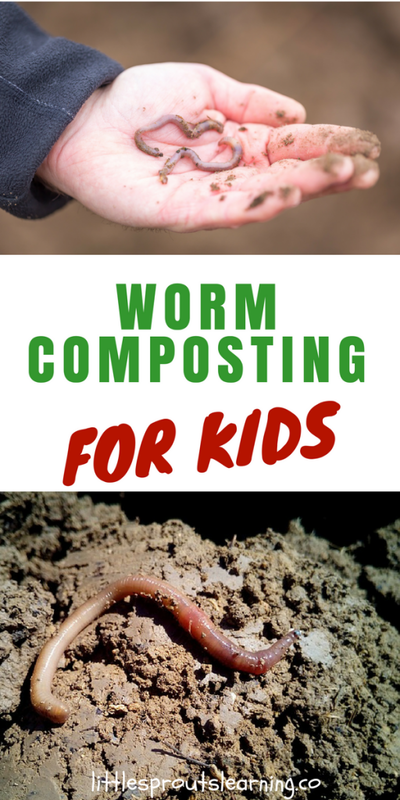 Worm composting for kids is easy and fun. 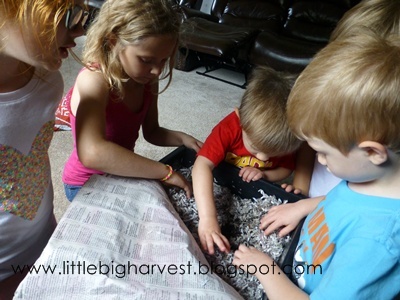 Setting up a worm bin teaches your kids so much and is beneficial for the garden too. Vermicomposting is a great introduction to caring for something other than themselves. 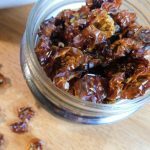 I have found a kindred spirit on the internet and she’s written a guest post for us. 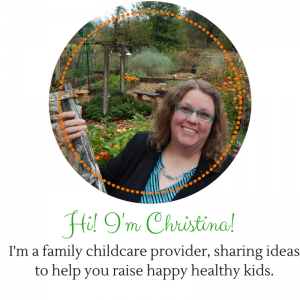 She’s a home daycare provider in Indiana that gardens with her kids too! I have been so excited to find a handful of other people who have a passion for teaching their kids to grow food. Andrea has been so supportive and helpful to me as I started this blog. Now she is sharing a post with us. I’m so excited for you to read it, check it out! 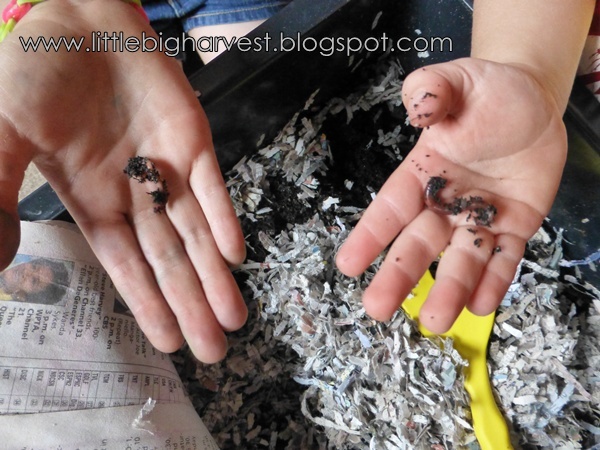 Note: For information on how to get worms for your kids to “raise” in your worm bin, click here. Over here at my daycare home, we love calling ourselves ‘urban farmers’, but honestly, what is a farm without animals? Though we have been expanding our gardens year by year, we have not yet added those rabbits and chickens that we long for. However, while we wait for the right time for ‘real livestock’, our animal of choice is…WORMS! 2. 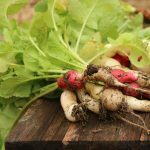 Worm castings are an incredible addition to your garden beds. Filled with nutrients and beneficial microbes, the castings help your plants grow big, strong, and more able to fend off pests and diseases. 3. Kids get to see how compost works, and how plants come full circle–veggie scraps become nutrient-rich compost that then helps grow new seeds into new plants. 4. Worms are a commitment, but an easy one. Kids will be introduced to taking care of ‘livestock’ on a tiny, low-risk scale. 5. Did I mention; kids love worms!!! Though there are simple plans online for making your own bin, we took the easy, albeit more expensive route, and purchased a ready-made bin. Since the bin came with everything we needed (except the worms, which we ordered separately), it was less intimidating for us to give this whole worm thing a try. Now that we are quickly gaining knowledge about the workings of a worm farm, I feel more confident that we could definitely make one from scratch. There are some days we go all day without even checking on our worms, but inevitably each afternoon someone will want to have a peek, dig their hands gently into the bedding, and pull out a healthy worm or two. We feed them once or twice a week (too much food is a bad thing, we discovered, as it will attract lots of mites), we make sure the bedding is moist but not soaked, and for the most part, we leave them be to silently work. Our first harvest of worm castings will not be ready until late August at the earliest, as it takes a few months to get a good enough amount to collect. At that point, we will be able to harvest a new batch every couple of months. What we don’t use in the cold months on our indoor plants will come in handy next spring when our soil is ready for some nutrition and new planting! To see how we faced and defeated our first challenge, click here. It was really not so hard! 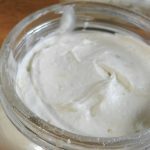 I love the ideas Andrea shared with us about worm composting! I hope to do more of this with my kids in the future. 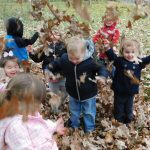 To learn more information about how to do worm composting and how to make your own worm bin, click here. Brilliant idea! Worms must be the lowest maintenance “pets” you can get, plus the kids will learn much more from them than, say, a bunny (although I do love bunnies).